Since 2001, KIPP DC has gone from the basement of a church to a network of 16 high-performance charter schools in the most under-served parts of Washington, DC VPP recognized KIPP DC’s potential and invested in helping them reach thousands more kids. Susan Schaeffler sat down with Carol Thompson Cole to tell the story. Susan Schaeffler – Founder and CEO, KIPP DC: I started teaching in 1992 and spent nine years working in the traditional school system. A lot of amazing people worked there, but, over time, I felt like the strongest teachers left. So after nine years of trying to solve the problem from within, I tried stepping out of the traditional system and creating a new one. We really wanted to create a school that attracted top talent and teachers that had a “whatever-it-takes” attitude, so that our kids had an opportunity to go to and make it through college. Carol Thompson Cole, President and CEO, VPP: We had experience working with charter schools to build and strengthen management and organizational capacity. As we looked around for investments in education, KIPP was one of the highest-performing school systems in the District of Columbia. We saw the passion that Susan and others had and their unwavering commitment to help more young people. We felt this would be a strategic investment: to take something good and help make it even better. Susan: Getting that seal of approval that comes with VPP investment was huge. We were instantly recognized as a more legitimate organization. What is so impressive about VPP are the large, game-changing contributions that they can make. Whether it’s financial, technical, or in human resources, the support they provide is really transformational. Carol: KIPP was an organization with a real growth plan, and when you have that intention, engaging with the community and with parents is huge. So we focused on building an engaged board of directors that could help with that. And then, of course, there was the creation of a strategic business plan. They took it very seriously and the plan laid the foundation for the results that they’ve gotten. Susan: VPP played a huge role in helping us grow to scale. When we first crossed paths with VPP, we had four schools and had penciled out a vision to grow to 10. We had to figure out the right growth pattern, the right timing, the where, and the how. Now we have 16 schools—we actually exceeded our vision. We often say that our strong foundation was based in the expertise of that business plan. Carol: There are two important pieces of the investment that stand out to me. One was helping KIPP build their development team—they’ve been able to recruit some very talented people since then. Second was helping to build a pipeline of talented teachers. Susan: I think hands down that was one of the biggest impacts. Early on, we were able to identify that one of our biggest obstacles to growth was going to be human resources, and that we were looking at a teacher shortage. We were given the space and time and support to create a teacher training program in which we could train 80 to 90 teachers a year to help fill our own teaching vacancies, as well as strengthen the teaching pool in the District of Colombia as a whole. Carol: We have truly built a trusted relationship between KIPP and VPP. From time to time we get calls from Susan and others, even though the investment has ended, asking us to help them think about things that they’re working on and make connections. We’re happy to continue doing that. Susan: We feel very fortunate to have had not only VPP’s expertise, but also their guidance and friendship over the years. I think when you look at non-profits and you look at founders in particular, they can get really caught up in the heavy lifting and the daily grind. Sometimes it helps to have somebody slow you down and engage you in thoughtful conversation, and that’s what VPP did. Carol: To see the impact that KIPP DC is having in and even beyond the Greater Washington community, to see them being leaders in the national education space makes me feel very proud. KIPP DC is a non-profit network of college-preparatory, public charter schools educating elementary, middle, and high school students. They have a 15-year track record of preparing students in educationally underserved communities for success in college and life. Create and sustain the highest-performing Pre-K through 12th grade college preparatory school system for the most educationally under-served children in Washington, DC, and expand from seven schools serving approximately 1,550 students to at least 3,400 students by 2015. Execute and evaluate a government and community involvement strategy that strengthens KIPP DC’s financial support, allows the organization to effectively engage the communities it serves, and empowers parents to advocate for the academic success of their children. Develop the appropriate management structure and roles to increase funding needed for operations, respond strategically to growth, and make strategic decisions regarding external opportunities and challenges. Ensure that the management team and KIPP DC can recruit and retain high-quality teachers efficiently and at the scale required for future growth. Enhance the data, evaluation, and performance management systems to collect and use data to support and refine its operations. Implement a stronger, more diverse, and sustainable fund development strategy that includes both public and private sources and that takes into consideration short- and long-term debt requirements and financing options. KIPP DC will build and retain capacity in both areas to satisfy fundraising needs related to growth. Develop an even more effective governing body that is consistent with KIPP DC’s strategic vision and aspirations. Particular emphasis will be on the board composition and committee structure. After expanding, KIPP DC served 5,200 students by 2015. As KIPP DC expands its number of campuses and the number of students they serve, it is also maintaining a laser focus on the goal of ensuring students are on the path to academic success. Planning and Focus: KIPP DC’s VPP-funded strategic planning process helped create the successful Capital Teaching Residency program. KIPP DC was awarded a $10 million grant from the Department of Education to grow the program. Human Capital – Board and Management: KIPP DC has attracted strong administrative and school leadership. 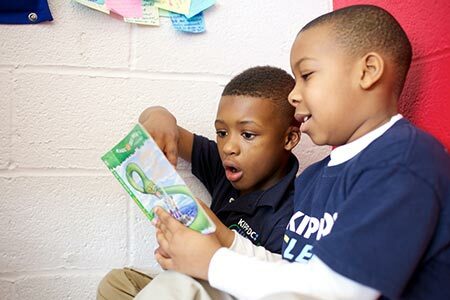 Outcomes Assessment: KIPP DC has shown positive strides in its focus on student success. In the 2016 PARCC results (the state assessment administered to all public school students), KIPP DC students’ growth outpaced the overall-DC average in English Language Arts (10 percentage points growth vs. a state average of 2 percentage points) and Math (5 percentage points growth vs. a state average of 3 percentage points). KIPP DC students have consistently been among the city’s top performers in Math proficiency rates, and we were pleased to see solid outcomes in 2016 (39% proficiency vs. a state average of 25% proficiency). Additionally, KIPP DC saw exceptional growth in English Language Arts across our schools. Relationships: With help from VPP, KIPP DC has more effectively engaged and begun strengthening relationships with parents and community stakeholders. In 2012, more than 90% of parents reported being satisfied with KIPP DC—an all-time high parental satisfaction rating.